Can Users Create Their Own Accounts in WooCommerce Private Store? The WooCommerce Private Store plugin restricts access to your WooCommerce store, either via password protection or user login. If you’ve enabled the ‘Logged In Users‘ option then you can use it with the built-in WooCommerce Account page, or any plugin that adds a front end user registration and login form. This allows your customers to create their own account, and receive a username and password that they can use to unlock the private store. WooCommerce Private Store hides the ‘Account’ page, so you can’t use this to allow people to register a new account. 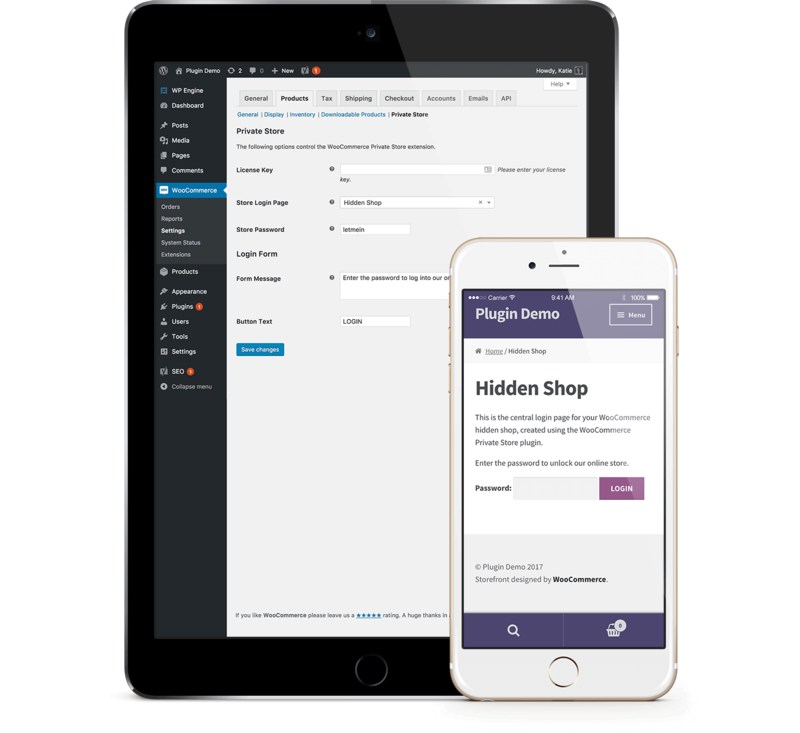 Instead, you need to install a WordPress user registration plugin such as the free Theme My Login plugin. This provides a shortcode which adds a user registration form to any page on your website. Tick the ‘Logged In Users‘ box on the WooCommerce Private Store plugin settings page. This will automatically unlock the store for all logged in users. Use the built-in Account page – Go to WooCommerce -> Settings -> Accounts and Privacy and enable the ‘Allow customers to create an account on the “My account” page‘ option. This will display a registration and login form whenever a logged out user accesses the Account page. Use a third party login plugin – Alternatively, use the Theme My Login plugin to create a registration and login form. Add the Theme My Login shortcode to a page, and add a link to your menu called ‘Register/Login’ or similar. (Optional) You can also choose where users are redirected after they register or log into their account. We recommend the Login & Register Redirect for WooCommerce plugin for this, as it lets you choose which page people are taken to after registering or logging in. By default, new users are taken to the Account page after creating an account – we think it’s much more user-friendly to redirect them to the Shop page. Your customers will visit the register/login page, register for an account, and WordPress will then email them their login details. They can then login and access the private store. Can I approve new user accounts before they can unlock the private store? Yes, you can do this by installing the paid ‘Moderation’ extension from Theme My Login. This holds new user registrations for moderation by an administrator. You must moderate and approve their application before WordPress sends them their login details. Can users create their own passwords? This depends on whether you are using the password protection option that comes with WooCommerce Private Store, or whether you are using the Logged In Users option that unlocks the store for logged in users. If you are using basic password protection, then it is not possible for customers to create their own password. Passwords can only be added by an administrator on the WooCommerce Private Store settings page. If you’re using the Account page as your registration form – Untick the ‘When creating an account, automatically generate an account password‘ option on WooCommerce -> Settings -> Accounts and Privacy. This will allow users to choose a password when they register. If you’re using Theme My Login for your registration form – Use the Theme My Login plugin settings to choose whether users can create their own password or whether this will be automatically generated for them.